The Papua New Guinea Institute of Public Administration (PNGIPA) has continued its revitalisation with the construction of new facilities which will support the development of ethical, capable public sector leaders. 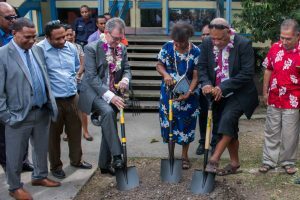 A new Administration Wing and Learning Resource Centre, which are being constructed through the Pacific Leadership and Governance Precinct, will provide modern spaces for vocational learning, teaching and discussion. Australian High Commissioner Bruce Davis said the buildings will provide facilities befitting the nation’s premiere school of government. “The new infrastructure will ensure that PNGIPA is able to continue its proud tradition of producing Papua New Guinean leaders,” Mr Davis said. “The Precinct is a symbol of the modern partnership between Papua New Guinea and Australia as economic and strategic allies. The new Administration Wing is on schedule to be launched in November and will house the ‘Bully Beef Room’, maintaining a connection to Papua New Guinea’s first generation of national leaders. The room is named in honour of the Bully Beef Club – the group of Papua New Guinean leaders that made a significant contribution to the intellectual discussion that preceded PNG’s Independence. Bruce Davis, DPM Secretary John Kali and Librarian Malala Moi break ground ahead for the construction of the Learning Resource Centre. Construction on the new Learning Resource Centre began in June following a demolition and ground-breaking ceremony. 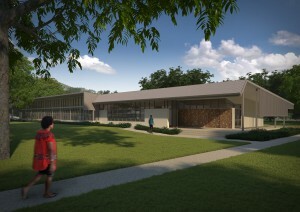 It will replace the original library, which was constructed in 1963 and gifted to the Councils of Papua and New Guinea by the local governments of Australia in 1966. The Learning Resource Centre will be ICT ready, ensuring PNGIPA has the capacity to deliver contemporary courses in a manner that is modern and accessible. The use of external shade and aspect have been considered to ensure energy efficiency and the comfort of staff and students. PNGIPA is also undergoing a process of institutional strengthening, led by its management team and supported by the Precinct. This includes technical assistance in strategic planning and management, ICT and student management systems, and a review of curricula at the institution. A Precinct partnership with the Australian Public Service Commission has also improved PNGIPA’s internal capacity to design and deliver courses, resulting in an increase in graduate numbers. More than 130 public servants have now graduated from PNGIPA with Australia-accredited diplomas, delivered through the Precinct partnership with the Australian Public Service Commission.